Today, while most of us have already lived in cities and towns, the world is still urbanising at an alarming rate. While most of the policy-makers are busy with mundane, daily life, they advocate the ‘end of utopia’. On many occasions, policies are merely old wine in the new bottle. They cannot merely tackle many burgeoning urban problems. Even worse, many policies, once implemented, create more problems than they were intended to resolve. In sum, without any utopian vision, it is difficult to debate about the way that our cities should proceed in the future. 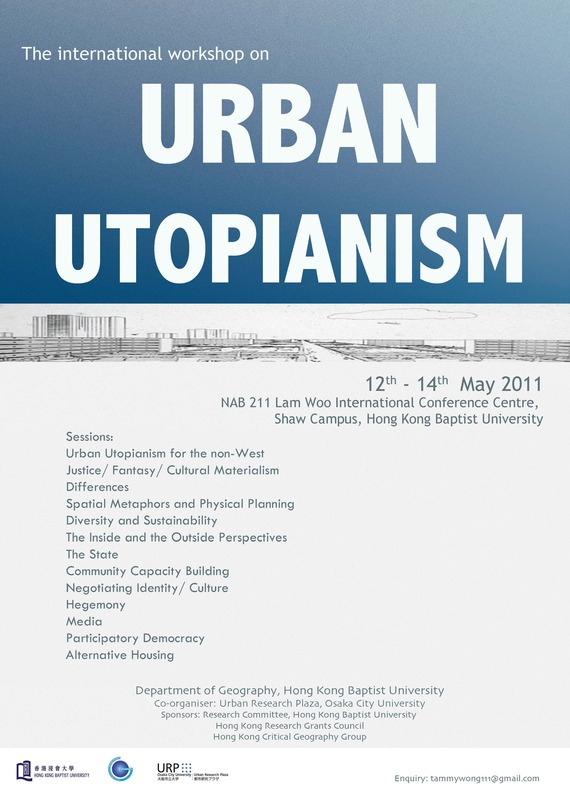 The utopian perspective, according David Pinder, is one that involves “the expression of desire for a better way of being and living through the imagining of a different city and a different urban life”. David Harvey charts a course to construct the future, or what he calls a ‘spatiotemporal utopianism’. This approach underscores a study of the historical geography of capitalism to provide clues as to how a dialectical utopian project can be grounded in both the present and the past. In particular, it requires us to unravel the internal contradictions and then consider how to develop the collective mechanisms and cultural forms necessary for the realisation of alternative urban visions based on these contradictions. This international workshop invites speakers across the world. It provides detail cases of experiment and argues conceptually different ways to imagine a different city. Sessions cover the different roles of art, urban, community, science, media, etc. in mobilising and defending utopian thinking, countering hegemonic spaces and ideologies, as well as redefining urban questions and politics. Alternative practices are presented, including housing for the homeless, everyday life, and other social spaces. For Henri Lefebvre, the world space has been colonised by commodity capitalism and state management and planning. Yet, out of the isotopias in urban space, there are heterotopias developed out of contradictions. This is where our utopia, the differential space, is developed.